I was delighted to hear the news that my friends, Keith and Anne, were to become proud grandparents, as their daughter, Sarah and son-in-law, Mark, were expecting twins in the early months of 2017. Having done a number of illustrations for Keith and Anne in the past (of a canine nature) it was nice to be asked to do some birth illustrations for their two grandchildren. The grandchildren are beautiful and the parents have named them Erin and James. Congratulations to all the family. Erin was very traditional in being ‘ladies first’, with her ‘little’ brother arriving only a minute behind her. The proud grandparents wanted some animal illustrations to feature on the birth pictures, but each of them were to have a different theme, so I suggested African/Safari animals for James and British wildlife for Erin. 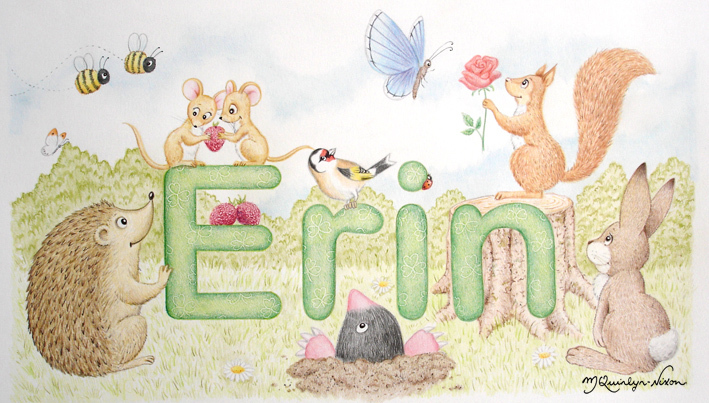 I was inspired by all of the Beatrix Potter merchandise last year, so it’s not surprising that Erin has a red squirrel, rabbit and a hedgehog in her illustration. This illustration is also the first to feature a mole, an animal that I can’t remember ever drawing before. 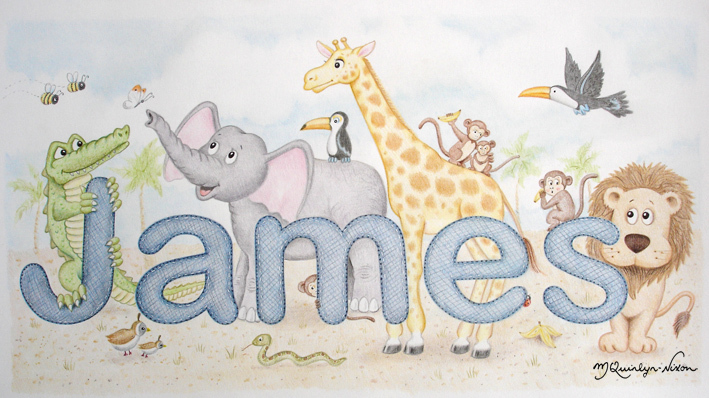 James, on the other hand, features animals that boy’s tend to like – particularly crocodiles, lions, monkeys and elephants. It also has my favourite animal, a giraffe in it too. I heard from Keith that the new parents, Sarah and Mark, are delighted with their children’s birth illustrations, which makes it all the more enjoyable for me, as I truly enjoyed drawing them. I hope that when they are older Erin and James will enjoy them and that they will be a wonderful memory for them in later years.